Entry for the 2015 National Championships is now available. Entry this year is £130, with a £30 discount if paid before 23rd August. The entry fee will get you three full days of sailing, Breakfast Bap and hot drink on Friday, Saturday and Sunday, Evening Meal on Friday and Saturday and Nationals Event T Shirt (only for entries before 23rd August). The Spinlock Phantom Grand Prix series supported by JJ Boats and Allen Brothers moved to Walton & Frinton Yacht Club in the heart of the beautiful backwaters of Swallows and Amazons fame. The 17 assembled phantom sailors had things other than exploring the muddy creeks and tributaries on their mind (though some became a little more familiar with them than they would have liked). Saturday dawned fine and bright with a good 15 knot breeze. The Race Officers Chris Brooke and John Sewell planned an Olympic triangle/sausage course in Hamford Water in champagne sailing conditions. Race 1 had a clear start and Matt House showed how consistent he was going to be staying clear of the chasing Daren Pike and Ian Sullivan to take the win. Places within the mid fleet changed regularly with Pete Shuttleworth and Phil Longley leading the rest home. Race 2 - After a delay to allow the Race Committee to reset the course after a wind shift, Matt and his Alton Water sparring partner Bob Portway reacquainted themselves with the latter taking the win after a closely fought battle. In the increasing wind the mid fleet positions had the added excitement of the odd capsize non more critical than Pete Shuttleworth who’s inadvert swim just before the finish gave Martin Jenkins the starboard advantage over Warren Martin allowing him to squeeze by. A little further back, the classic woody sisterships of Simon Hipkin and Dale Jones were proving that well sailed phantoms of any description can provide competitive racing when in big fleets. Race 3 was to be a beat to the windward mark followed by a reach to a spreader mark off Stone Point at the entrance to the river and a drag race back to the club against the wind and tide. Matt House pulled off a great port tack start and was away opening up a big lead at the turn for home. Unfortunately for him Ian Sullivan reveled in such conditions performing a ‘slow death’ by cutting Matt’s lead bit by bit on every tack and taking the lead with only 150 yards to go. The rest of the fleet tacked back and forth against the fast flowing and rapidly draining river adding extra motivation to keep going or it would be a long walk home. Daren Pike, Paul Church and Bob Portway rounded out the top five. Come and play in the waves! 10 Phantom helms rigged in bright sunshine with two races before lunch in 15 knots of steady breeze to look forward to. Matt House took line honours in both with Chris Roberts banking 2 seconds. Following a proper Phantom lunch the fleet set off in what seemed a slightly fresher breeze. Matt took this in his stride and banked another couple of bullets in part due to his blistering downwind speed and sound tactics to ensure victory overall. 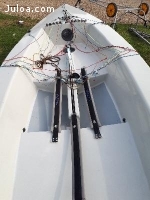 To be competed for on 22 March 2015 at Wimbleball Lake – start 12.00. Kindly sponsored by Exmoor Ales who have a brew of the same name. Large fleets are expected at each event and they complement the existing regional open programme so you should expect close racing, a friendly and helpful fleet and a great social. The events are aimed at providing close racing throughout the fleet and will attract a mix of abilities so will suit if you are new to the fleet or a seasoned campaigner. We look forward to seeing you at an event during the year. Just two weeks to go until the Phantom Open at Crosby SC on Sunday 12 October 2014 – the last event of the Phantom North 2014 series, sponsored by Standards Plus Ltd ( www.standardsplus.co.uk ). 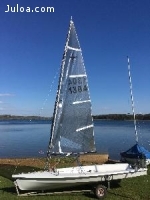 Crosby is an interesting place to sail – a marine lake just behind the sand dunes, so we get Westerly sea breezes with flat water which is great for speed. Crosby SC ( http://crosbysailingclub.com/ ) is quite easy to find, postcode L22 1RR, in north Liverpool and is close to the main roads. The changing facilities are modern, clean and warm.